It has been said before that the greatest measure of an artist can be found in the list of other individuals who assemble to pay him tribute. 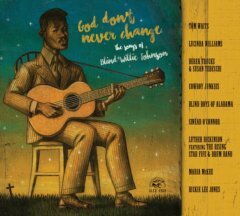 If we take that as the truth, it can also be taken as doubtless that Blind Willie Johnson is one of the most important musicians to ever pick up a guitar and play the blues; on God Don’t Never Change, a veritable who’s who collection of celebrated musicians assemble to not just play his music, but to create an image unlike that of any other. It is as unique and fantastic as readers might expect any album featuring the likes of Tom Waits (who goes the extra mile and contributes TWO covers), Lucinda Williams (who also does two tracks), Luther Dickinson, Sinead O’Connor, Blind Boys of Alabama, Cowboy Junkies, Derek Trucks and Rickie Lee Jones to be of course, but made even better still by the fact that there is genuine passion present in each performance. While it’s not uncommon for at least a couple of tracks to get phoned in for a tribute compilation, no such fluff appears here as everyone involved makes sure they put their stamp on the songs they’ve chosen to cover in addition to pouring enough heart and soul into them to ensure that each is very, very memorable. Perhaps intentionally, God Don’t Never Change bucks tradition as it sees one of the largest names involved open the proceedings. Here, Tom Waits covers â€œThe Soul Of A Manâ€ in a manner which jives very closely with the sonic angles he took on 2011’s Bad As Me (the backing band is small â€“ featuring the singer’s wife and son as live backing as well as a bunch of samples), but the wooden, grainy vibe of vintage blues music gets upheld. Waits growls as only he really can and that alone is enough to set fans’ hearts a-flutter, but the singer really seeks to make sure listeners know he’s paying tribute to another artist here by blending/toning down his inimitable persona and letting the song itself be the primary focus; such intentional bowing is really attention-grabbing and will likely hook listeners and get them really listening closely to this album. Second up is the first of Lucinda Williams’ two covers and, perhaps because the Waits introduction was so captivating, listeners will finds themselves flat-out wowed by the cover of â€œNobody’s Fault But Mineâ€ too. As was the case with â€œSoul Of A Man,â€ Williams keeps â€œNobody’s Fault But Mineâ€ spare on the extra instrumental help but really pours some hypnotic darkness into it; here, the singer sounds a little hollow and exhausted but it suits the emotional character of the song perfectly. The darkened, wooden vibes continue as Derek Trucks & Susan Tedeski, Blind Boys of Alabama and Luther Dichinson each chip in some trad-feeling covers, but the going gets a little spicier when Cowboy Junkies and Sinead O’Connor both take the opportunity to beef up the arrangements on their respective contributions. In Cowboy Junkies’ case, the going gets a little more sci-fi in flavor and noir-ish (not to be confused with dark) as a raspy, sample reoccurs and Margo Timmins gets back to the more soulful but clipped vocal phrasing she utilized on the Trinity Sessons in 1988. Conversely, O’Connor gets positively biblical when she steps forward to cover â€œTrouble Will Soon Be Overâ€ and injects her vocal performance with more Southern Baptist flavor than she’s ever expressed anywhere before. These turns are shocking and beautiful and a little salacious in the fact that some of them are perfectly unexpected. In the later playing of the album, both Williams and Waits reappear to offer up second helpings of their flavor that no listener will be able to deny (Waits continues keeping his performances simple with even less help for â€œJohn The Revelator,â€ while Lucinda Williams actually steals the show with her humming, moaning rendition of the album’s title track) and Rickie Lee Jones shows up to burn the album down and close it with her more â€œcity bluesâ€ rendition of â€œDark Was The Night â€“ Cold Was The Ground.â€ In that, while some purists will balk at how the album ends, many listeners will be able to appreciate the distance to which the songs get stretched and/or manipulated; it shows how versatile they’re capable of being, and the star power of the performers helps to illustrate the breath of the music’s appeal. That said, God Don’t Never Change is an awesome tribute album in both sound and style.